One of the hallmarks of a great con artist is that his victims will return again and again to be fleeced. A few months ago I interviewed psychologist Maria Konnikova, author of The Confidence Game: Why We Fall for It . . . Every Time, and she told me there have been many cases where con victims have happily paid the legal expenses of con artists when they were prosecuted in court. Sergei Mavrodi sounds like a great con artist. He's been running a pyramid scheme for nearly 30 years. It's called the Mavrodi Moneybox Mondial (MMM) and despite the fact that Mavrodi was imprisoned for tax fraud in Russia in 2000, there is a long line of suckers begging to throw money at him. He has now moved into Nigeria, and is wiping out the savings of people living there. If you visit the MMM Nigeria website, you will be greeted by live person ready to help you in a chat window. YES, IT IS POSSIBLE TO GET 100% PER MONTH HERE, BUT THIS IS NOT A HYIP! This is a community of ordinary people, selflessly helping each other, a kind of the Global Fund of mutual aid. This is the first sprout of something new in modern soulless and ruthless world of greed and hard cash. The goal here is not the money. The goal is to destroy the world's unjust financial system. Financial Apocalypse! Before you join, be sure to be acquainted with our IDEOLOGY! 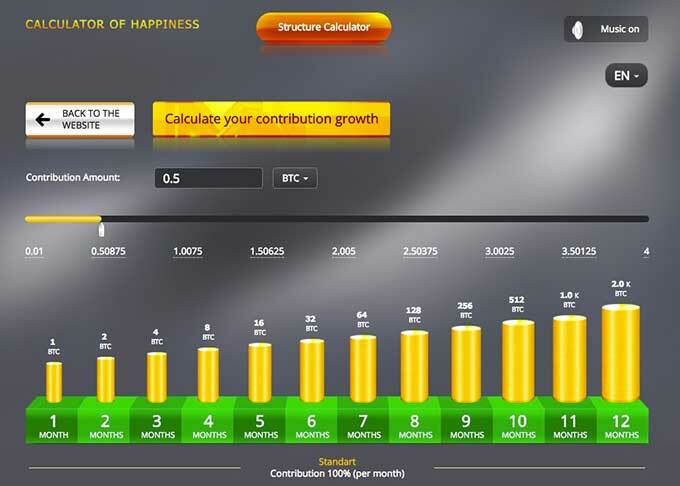 If you are interested in learning how much you'll make, use the handy MMM "Calculator of Happiness." If you invest 1 bitcoin ($4700) per month, in just 12 months you'll have 4,100 bitcoins ($19 million). I'm sold! Mavrodi was Russia’s Bernie Madoff. A trained mathematician who sports trademark oversized glasses and a comb-over, he has perpetrated one of the biggest pyramid schemes in the world. At its peak, MMM was raking in so much cash that its founders spoke in terms of how many “rooms” full of banknotes they had. In 1994, four years after it began, the scheme collapsed. The following year Mavrodi was elected to the Duma, Russia’s parliament, after convincing investors he’d bail them out with taxpayers’ money. Instead, he fled within a year after Russian authorities stripped him of his parliamentary immunity so they could put him on trial. After eventually serving a four-and-a-half-year sentence, Mavrodi launched a failed presidential bid, then hosted a radio talk show called Pyramid in which he gave financial and life advice to callers. Then he branched out beyond the former USSR, taking his racket to the US, India, and China, among other places. The endgame for MMM, Mavrodi frequently tells journalists, is “a financial apocalypse” that will destroy the global financial system. It will then be replaced with his own, fairer system, where users call themselves “Mavrodians” and trade using “Mavro” currency units. More than 230 million users have signed up globally so far, according to a perennially upward-ticking counter on its official website. Phrenology (the fake science of predicting personality from the shape of your cranial bones) is like Freddy Kruger, an unkillable demon who rises from the grave every time some desperate huckster decides they need to make a few extra bucks.